When Les Left Hand enters a room, people notice. A towering presence at 6’ 5,” he carries broad shoulders and a luminescent image of confidence that would make one think that he isn’t the type of man to “tangle” with. But in truth, he is the epitome of the expression “gentle giant.” He looks younger than 50, but his mature demeanor becomes quickly apparent. After high school, he fought forest fires in Yellowstone Park, cooked in several restaurants, and attended several colleges, earning credits here and there. Determined to graduate from college, he eventually earned a Bachelor of Science degree in Applied Management from Rocky Mountain College in Billings. Les began at an entry level position at MasterLube — then was promoted to the position of “closer,” and then to an assistant and, ultimately, he was promoted to managing three MasterLube stores in Billings. He relishes those memories and said, “It was fun and inspiring to work with people who may have been down and out and to give them second chances.” A lot like what his mentor, Bill Simmons, did for him. While Les and his wife, Leslie, and four grown children, live in Billings, his week includes traveling to the three Head Start locations and overseeing its operations, meeting with its teachers, students, and administrators. 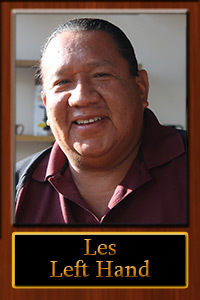 Les’ journey has taken him full circle. His vision quest seems to be fulfilled as he is surrounded by young children and students–teaching and helping them grow—and has had the honor of helping and respecting his tribal elders.